Small car segment battered by low fuel prices. 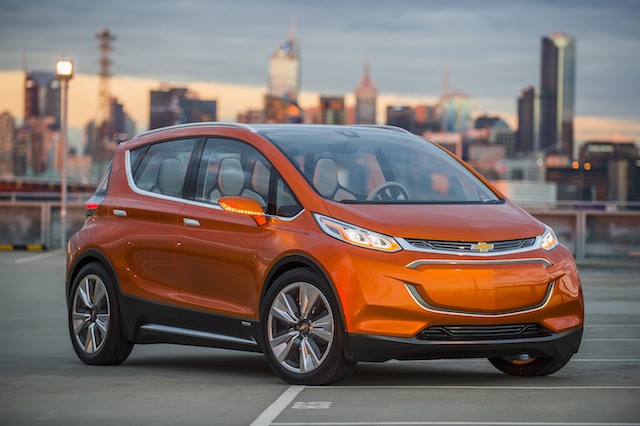 Orion plant will begin production of the Chevrolet Bolt for 2017. Arguably, Chevrolet has the strongest line up it has ever presented in the US market, with solid entries ranging from the full-size Impala to the diminutive Spark. Truck and SUV sales are a bigger factor than ever before, giving the bow tie brand a solid product line from top to bottom. But not all models are succeeding as consumers continue to make the shift to trucks and SUVs, and at the expense of small cars. Indeed, sales for the subcompact Chevrolet Sonic have fallen by 35 percent year-to-date through September, after rising 9.2 percent in 2014. Gas prices trending toward $2 per gallon is one reason why sales have dropped. Plunging sales mean GM has had to rethink its production plans. To that end, workers manning the second shift at its Orion Township (Michigan) plant will lose their jobs in January. The plant makes the subcompact Sonic as well as the compact Buick Verano, the latter seeing its sales fall by 27 percent through September. The Orion plant has benefited from $962 million in upgrades since 2010, including $405 million in the past year alone as the automaker readies production of the Chevrolet Bolt, a small pure electric model. The start of production for the new model is months away. In the meantime, GM must align both production and its workforce with demand. As difficult as layoffs are in the auto industry, this one comes with a silver lining — affected workers will be able to transfer to the Detroit-Hamtramck Assembly plant 35 miles south of Orion. That plan will double its workforce in 2016 by adding 1,200 hourly and salaried jobs as it brings on a second shift. Hiring is currently underway and soon to be displaced Orion workers have an opportunity to find new jobs. Hamtramck currently builds the Chevrolet Volt, Impala and Malibu as well as the Cadillac ELR on a single production line. Beginning early in 2016 it will start production of the all-new Cadillac CT6. Like Orion, Hamtramck has also received upgrades over the past six years to the tune of $1 billion. The Chevrolet Sonic, previously sold as the Aveo, is available as a 5-door hatchback or as a 4-door sedan. Introduced in 2012, GM has not announced plans for a new model yet. The automaker may be waiting out the market to determine if future demand warrants such an investment. Other automakers appear to be in the same wait and see mode, including Kia with its Rio. Introduced in 2012, Rio sales have fallen nearly as much as the Sonic and are down 31 percent through the same nine-month period. Notably, Ford Fiesta, Honda Fit, Toyota Yaris, and Hyundai Accent sales are up for the year. In addition, the Scion iA, an all-new model introduced in September, is showing strong sales out of the gate. Orion’s other model, the Buick Verano, is coming to the end of its first generation run. An all-new model is slated to arrive in 2016 for the 2017 model year, a vehicle that shares its underpinnings with the Opel Astra and Chevrolet Cruze. The new Verano is already on sale in China where both a hatchback and GS editions are now offered. There is no word on whether the US market will receive either new edition. Sales of another small GM car, the Chevrolet Cruze are also off year-to-date. However, a new model arrives in Chevrolet showrooms this fall, one that is expected to be more competitive in a segment led by the Toyota Corolla followed by the Honda Civic.